"lokantas" are eating places specialized in quite inexpensive regional Turkish food. Try them too. The history of modern Turkey starts with Mustafa Kemal Atatürk, President of the Turkish Republic from 1923 until his death in 1938. 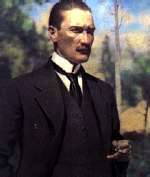 Dramatic steps were taken by Atatürk, Father of the Turks, this title was officially given to him during his presidency. In his program of modernization, secular government and education played a major role. Making religious faith a matter of individual conscience, he created a truly secular system in Turkey, where the vast Moslem majority and the small Christian and Jewish minorities are free to practice their faith. As a result of Atatürk's reforms, Turkey -unlike scores of other countries- has fully secular institutions. This is a typical item, a specialty of this region you should take home as a souvenir, it's called the Boncuk, the Little Magic Stone that protects one from the *Evil Eye* (pronounced 'bon-dschuk'), you will see this blue glass piece everywhere here on the Aegean Coast. But what is behind this superstition? In a shortened version we will try to explain. Once upon a time (yes, it starts like in a fairy tale) there was a rock by the sea which, even with the force of a hundred men and a lot of dynamite, couldn't be moved or cracked. And there was also a man in this town by the sea, who was known to carry the evil eye (Nazar). After much effort and endeavor, the town people brought the man to the rock, and the man, upon looking at the rock said, "My! What a big rock this is." The instant he said this, there was a rip and roar and crack and instantly the immense and impossible rock was found to be cracked in two. The force of the evil eye (or Nazar) is a widely accepted and feared random element in Turkish daily life. The word *Nazar* denotes seeing or looking and is often used in literally translated phrases such as "Nazar touched her", in reference to a young woman, for example, who mysteriously goes blind. Another typical scenario. A woman gives birth to a healthy child with pink cheeks, all the neighbors come and see the baby. They shower the baby with compliments, commentating especially on how healthy and chubby the baby is. After getting so much attention weeks later the baby is found dead in his crib. No explanation can be found for the death. It is ascribed to Nazar. Compliments made to a specific body part can result in Nazar. That's why nearly every Turkish mother fixes with a safety pin a small Boncuk on the child's clothes. Once a Boncuk is found cracked, it means it has done his job and immediately a new one has to replace it. Located in the heart of the hustle and bustle of central Bodrum Ibo is a traditional Turkish restaurant set in the midst of the vines giving essential shade. Traditional Turkish musicians play their trade in the small restaurant. There are a variety of foods on offer from simple Turkish dishes to basic western food. Pricing is medium range. Epsilon - in a romantic garden. The service on bills is not specially indicated in hotels or restaurants, you should calculate 5 to 10%. In some of the existing travel guides the amount of 15% is recommended - (living here) this we found to high. Of course as for every service, tipping is expected and the salaries are very low in Turkey, so many people are dependent on this sort of extra income. If the car is standing nicely washed and polished in front of the hotel next morning - an English pound or two dollars would be just nice. In general - like everywhere all over the world: the right tipping can open doors - so it does in Turkey. Water from the tap is mainly water for use, like for washing, you should not drink it. To have drinking water -we recommend the mineral water in those plastic bottles.This water has an outstandingly good quality all over Turkey. Nach dem Bau einer Burg auf der Insel Kos benötigten die Ritter ein Bollwerk auf dem Festland. Die Suche nach einer neuen Wirkungsstätte führte die Johanniter zu einer zwischen zwei geschützten Buchten gelegenen Insel (einst war die Burg nämlich vollkommen von Wasser umgeben). Und etwa um das Jahr 1413 begannen die Johanniter-Ritter von Rhodos mit dem Bau ihrer Burg auf der kleinen Insel, damals Zephyrion genannt. Diese Tatsache kann man heute noch konstatieren: viele Säulen-Elemente und Friesstücke sind in die Mauern des Kastells eingebaut. Die vom Fundament des Mausoleums entnommenen grünlichen, sorgfältig behauenen Steinblöcke wurden für die Burgmauern verwendet. Der Vatikan mass dem Kastellbau grosse Bedeutung bei und entsandte Christen. um dort zu arbeiten. Man erliess ein päpstliches Dekret, welches all denjenigen. die beim Bau behilflich waren eine Aufnahme in den Himmel garantierte. Der deutsche Architekt Heinrich Schlegelholdt beaufsichtigte den Burgbau und sorgte für dessen neuesten Stil: die Franzosen entwickelten zu der Zeit die Kunst des Kanonengießens, also wurden die Burgmauern oben, besonders jene landeinwärts gelegenen mit Schießscharten versehen. Die Kreuzfahrer hatten eine mächtige Kriegsflotte, sodaß sie vor einem Angriff von Meeresseite her nur wenig Angst hatten (die dem Festland zugewandten Mauern sind wesentlich dicker als die dem Meer zugewandten). Die Johanniter bauten auch einen Wachturm auf einem Berg gegenüber dem Kastell, die Bucht überblickend; heute erheben sich seine Überreste über einer Ferienanlage der türkischen Armee. Die Ritter nannten ihre Stadt "Mesy", wohl in Unkenntnis ihres antiken Namens und wahrscheilich auch der Geschichte von Halikarnassos, und die neue Burg von St.Petrus wurde bald die wichtigste Stellung ausserhalb Rhodos. In Verbindung mit dem Kastell in Antimachia auf der Insel Kos hatten sie die damals am meisten befahrene Schiffahtsroute unter Kontrolle. Nach der Eroberung von Rhodos im Jahre 1523 wurde die Stadt wieder dem Türkisch-Osmanischem Imperium angeschlossen. Im Jahre 1770 beschoß die russische Flotte die Stadt. Während des griechischen Aufstandes im Jahre 1824, wurde die Burg von den Türken als Hauptquartier benutzt. Im ersten Weltkrieg versuchte das französische Kriegsschiff 'Duplex' am 26. Mai 1915 die Stadt zu besetzen, doch gelang es den hiesigen Truppen Widerstand zu leisten. Als jedoch die Türken im ersten Weltkrieg besiegt wurden, besetzten die Italiener am 11. Mai. 1919 die Stadt. Sie benutzten die Festung als Hauptquartier und achteten darauf mit den Einwohnern in friedlich zusammen zu leben. Während des Befreiungskrieges, den Mustafa Kemal Atatürk in Anatolien begonnen hatte und der sich zu Gunsten der Türken entwickelte, wurde die Besetzung am 5. Juli 1921 aufgehoben und die italienischen Truppenzogen sich aus Bodrum zurück.